Half past midnight came and went. At seventeen minutes to one, Sam appeared, bow tie hanging untied around his neck and shirt sleeves rolled up to his elbows. Bannok dropped from his perch in the rafters, interrupting Sam's lazy saunter. He stood with arms crossed and one eyebrow raised, waiting. Sam, the idle menace, grinned at him. "Yo?" Bannok repeated incredulously. "Almost forty minutes late, and you open with yo?" Sam shrugged, unrepentant. "Yeah, sorry about that. After party in the musicians' quarters, hard to get away from. You manage to scope out some good options for us then?" Bannok glared. "No thanks to you, layabout. Planning to quit pirating and become a full time musician?" Sam set his jaw mulishly, sensing the brewing argument. "I might. Someone went to all the effort to forge me this fancy recommendation letter from Nabile, seems a shame for it to go to waste. The trombone's not half bad once you get around the fact that you're blowing raspberries down a metal tube. Are we going to loot and pillage or what?" Bannok huffed, frustrated. "Just... Fine. Never mind. The third floor's got some good ones. East wing mostly, but there's a few in the west wing I'm dubious about - they might be too old. Hard to tell without closer examination." "Lead the way, Cap'n," Sam offered with an exaggerated bow. By the time they reached the east wing, the argument, like so many other trivial arguments between the brothers, was forgotten. It was inevitable; they had different personalities. Different personalities clashed. Bannok had Sam and Sam had him and between them they had a ship and a sense of adventure, and Bannok was the responsible one that kept a level head and made sure it worked. Sam... Sammy was Sammy. He'd known no other life, and he'd grown up with wanderlust in his bones. He flitted from place to place and he gambled and won and tried his hand at magic tricks and won that too. He picked up languages that Bannok could only stumble through, learnt to play a saxophone just for something to annoy his older brother with, charmed the gold coins off everyone wherever they went. So they clashed, sometimes. Bannok planned and Sam took risks and so long as they didn't disagree on anything major, everything was golden. It worked for them. "These are our best bet, I reckon," he said, pointing out four paintings down the hall. Three were of grand, sweeping landscapes, the sort that painters loved to populate with soft brush strokes and girls in fussy dresses. The fourth was a portrait, a young white gelert with her hair done up in a complex set of braids. It didn't look like something an old pirate king would have commissioned, but it was of the right time, and the artist had painted a model boat onto the mantel piece in the background. It seemed fitting. "Want to go over them together, or you take two and I take the others?" Sam asked, already squinting at the nearest landscape. "Split. Take the left; I'll do the girl and the cammylian forest, yeah?" They worked in companionable silence, checking the paintings for any unusual hidden compartments. The intel they'd gathered had put the painting as a decoy for the map; a false back to the frame, they assumed. Either that or the map was incorporated into the painting itself, but none of them that Bannok had seen would fit that theme. So - false back, painting hung over a safe, hidden compartment inside a thick gilt frame. Anywhere a scrap of parchment could be hiding. The cammylian forest revealed none of those. Neither did Sam's kau pasture, though it did show itself to be boring and uninspired, according to him. "You notice, every kau here has the same pattern of spots? Like, not every kau is spotted. And not every spotted kau has a wonky splodge on their left shoulder. Lazy, this. Shoddy." "So now you're branching into the visual arts, are you?" Bannok teased good naturedly. "Music not enough to satisfy your artistic palette?" "What can I say? Talent such as mine can't be kept quiet. I've got nothing on the seascape either - any luck with your gelert?" Bannok huffed. "Don't think so. There's something here, I'm sure - that ship in the background? It's a dead ringer for the White Horn's ship, the Gallant Steed. This has got to be the one, but it's clean as far as I can tell." Sam hmmed. "It might not be a complete loss. We know the White Horn had connections here, yeah? So, maybe this is just one of those. Some other connection." It was as good a theory as anything. Bannok pushed the feeling in his gut aside - the painting was a bust. The east wing was a bust. And the night itself was a bust; it was gone two in the morning. "You playing in the square again tomorrow?" Sam visibly brightened, his yawn turning into a happy grin. "Yeah! It's reeling tomorrow - you ever heard a reel played in full brass? It's major epic stuff." "Yeah?" Bannok returned the smile with one of his own. "Maybe I'll come down to dance. It's been a while since I've seen you play in a group. No offence, but the stuff they have you doing in the fancy parties is complete rubbish." "I know, right? What is it with rich people? Uncomfortable clothes, not enough food, boring music. I take back ever wanting to be rich, it does something to your head." "I thought you wanted to eat your weight in fish pops every morning?" "That's a point. Can I have the fish pops without being rich?" "Sure. You're stealing them though." "Bail me out when I'm caught?" The west wing turned up nothing either, and nor did the third alcove from the left in the main gallery that Sam's tuba playing friend had told him about. It was the last night of the celebrations. They had to find the map tonight. "It's got to be here." Bannok ran his hands through his hair in frustration. The gelert smiled demurely back at him from her wooden frame, and he could almost swear she was mocking him. "There's nowhere else it could be. We've just missed it, that's the only explanation." "We've checked this stupid doodle four times," Sam complained from his seat on the floor. His tipped his head back to knock against the wall. "There'll be a secret gallery somewhere, more paintings we haven't found." "No, it's this one. I know it's this one." The age of the painting, the model of the Gallant Steed in the background, even the illegible signature in the corner that trailed off into a slanted X - everything matched up. Sam threw his hands up in frustration. "We don't even know who she is!" "La Dauphinne Amelie de la Mer," a soft voice cut in. Sam and Bannok scrambled away from the painting, hearts racing. It was a xweetok that had spoken - the same haughty xweetok that had insulted Bannok that first night. She was staring at the painting wistfully, paying no attention to the would-be thieves. The pause dragged. Sam and Bannok shared an awkward glance - had she realised what they were doing? "My lady?" Bannok eventually tried, hiding a wince when her ear flicked towards him. "The gelert," she elaborated, though she didn't move her gaze. "Amelie. She was lost to us a few years ago; Baeyren had this commissioned in her memory." "I thought Lord Baeyren was a kougra?" Sam blurted. Bannok flapped a hand at him to be quiet, but the xweetok had already turned to look at them. She was far less imposing without her towering hairstyle and over-the-top gown, but even so she seemed elegant and distant. She nodded. "He is. The princess Amelie was his niece - by adoption, though she was no less beloved for it." Her gaze sharpened, and Bannok's breath caught. "Take care how you treat her. His Lordship will not stand for her memory to be disrespected again." 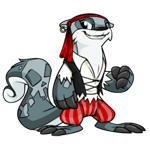 A swirl of green silk and floral perfume and the xweetok was gone, leaving the two pirates stunned and wary. "She seemed... nice?" Sam offered, breaking the silence with his typical bluntness. Bannok grimaced. "Don't let it fool you. She's a complete snob when she's with the rest of her rich friends." He turned back to the painting. Whether or not the xweetok knew what they were doing, they couldn't afford to miss this opportunity. "Amelie has to be related to the White Horn. We'll open it up. Maybe there's something on the inside of the frame we've missed." The painting itself wasn't large, perhaps a foot and half in each direction, but the frame was heavy. Between them they wrestled it to the floor and laid it face down. "It's solid," Sam said, rapping his knuckles against the frame. "Nothing in here." Bannok flicked open a pocket knife. "If it's not there, that leaves only one place." He worked the thin blade under the edge of the frame, gently easing the canvas free. "Almost there..."
"Curse it," Sam spat. "She called the guards on us. That sneaky -"
"No time!" Bannok yelled, dragging Sam to his feet and into a stumbling run. The last of the painting tore free from the frame, leaving it to clatter to the floor behind them. He rolled the canvas into a sloppy parcel and shoved it into the pocket of his coat. The guards were shouting, running after them in a clatter of armour and swords. "Left!" Sam shouted as they neared the end of the gallery. Bannok skidded round the corner, shouldering the doors open in the same move. A window flashed past and he swore as he realised which way they'd gone. "The way out was right!" "Are you serious? You're going to get us caught because you sent us back for your trombone?" Sam's reply was lost as they reached the staircase, only to find another pair of guards advancing up it. "Thief! Treason!" they shouted. Their swords were the golden ceremonial ones they'd been wearing from the parade, but Bannok didn't want to take the chance that they were any less sharp than their standard weapons. "Split!" he yelled to Sam. The lutari flicked his tail in acknowledgement and dived forwards. Bannok left him to it, trusting Sam to make his own way out. He had bigger problems in the form of the angry tonu from the west wing that had caught up to him and was in full charge. Sparing a glance for the two guards going after Sam he swung himself over the balcony and landed with a thud on the marble bannister. Somewhere above he heard Sam throwing insults at the guards and their bellows of rage in response, but he had no time to laugh. The tonu was already on the stairs - and worse, that was a mynci scaling down the wall to cut him off from below. Bannok swung at the window again and this time the panel shattered. He kicked the glass aside and ducked his head to step through, but he hadn't been fast enough. "Hold it right there, thief," the mynci snarled, bringing his sword up to rest against Bannok's throat. "Back inside. Hands where I can see 'em." Bannok moved slowly, lifting his hands and turning his back to the broken window. The sword hovered mere millimetres from the fur on his neck. The mynci nodded in grim satisfaction. "Now, you gonna come quietly or you gonna come in chains?" "I was rather hoping I wouldn't come at all," Bannok answered pleasantly, and pushed himself backwards out the window. The mynci cursed and grabbed for him a second too late. Bannok hit the grass hard and rolled, crushing what might once have been a rather lovely arrangement of starflowers as he did so. He pushed himself up and into a sprint, ignoring the flare of pain from the shoulder he'd landed on. Back left corner of the gardens, he reminded himself. He'd scouted it when they first arrived - the gate's hinges had rusted through, but it was so overgrown that it hadn't been replaced. Get to the back left corner, get out the gate, keep low by the river bank. He'd be home free. He heard the heavy clunk of the doors opening behind him and put on speed. Amended his plan a step; first lose the guards, then get to the back left corner, out the gate and home. When Bannok dragged himself to the Silver Arkmite at last it was past four in the morning and the sky was beginning to lighten in preparation for the dawn. He was cold, covered in river mud, and exhausted. The ache in his shoulder had spread down his entire left side. The very last thing he wanted to see was his younger brother lounging in the rigging with a half-eaten tart in one hand and his blasted trombone held between his knees. "Look what the angelpuss dragged in!" Sam greeted with a cheery wave. "All go as planned, then?" "Not a word," Bannok growled. "However you managed it, I don't want to know." "As my captain commands," the lutari agreed, not bothering to hide the grin from his voice. "Chef gave us some leftovers - they're in the galley if you want them." Chef. The same ladle-wielding chef that had ruled the palace kitchens with fear and an iron fist. That chef. "Chef likes me," Sam added helpfully. "Don't want to know," Bannok repeated, and stalked below deck to find a clean change of clothes and a cloth to wipe the gunk out of his hair. When he emerged, mud-free and feeling himself again in his own clothes, Sam pushed a plate of leftovers towards him that was more icing and jam than actual food. "Chef might not like me once he realises exactly which leftovers I took," he added as an explanation. "But I didn't figure we'd be going back." "Not any time soon, no." Bannok pushed the plate aside, too tired for such sweet food at the moment. He retrieved the painting from his pocket and spread it out on the table. "This is it, then," he said grimly and stared at Amelie as though he could tell her secrets from her infuriating smile. His eyes caught on the torn edge where he'd ripped the last part of the canvas free from its frame. It was fraying already - but unevenly, the back far more frayed than the front. With a frown, Bannok flipped the corner over. "It's double thickness," Sam breathed. "He's hidden the map between the two pieces of canvas. Sneaky, sneaky pirate." The join was almost impossible to see around the edges where Bannok had cut the canvas away; it was only visible where it had torn. He slid his knife into the gap and worked it down the side. When he tipped the picture up, a scrap of folded parchment fell out onto the galley table. "That's the map piece?" Sam asked dubiously. Bannok shook his head, not trusting himself to speak. He opened the parchment and read the words inside with something akin to despair. Sorry, Little Ami. I need it more than you. He pushed the parchment away from himself and dropped his head into his hands. "It's a bust," he spat. "Someone got there first." "They what?" Sam snatched the message and read it for himself, his eyes growing wide. "They - someone else is after the treasure. When did they get this? Which other pieces do they have?" "I don't know." Bannok frowned, trying to remember something. "Didn't the xweetok say that Amelie had been disrespected before?" Sam nodded, grim. "Someone else must've disturbed the painting - I'll bet that's when they took it. But without knowing how long ago it was, we don't know if they're still searching. Maybe it was when the White Horn first disappeared, maybe they've given up?" "It was the Comte de Rochefort, just over two months ago." Sam leapt up with a muffled curse, dagger out and at the ready. Bannok just turned his head sideways, too tired to be surprised. "How did you get in here?" Sam demanded. The xweetok - because it was the same ruddy xweetok - arched an eyebrow. "The hatch was open," she said, as though it were obvious. Bannok doubted that; Sam may be prone to bouts of idiocy, but locking the door was second nature to both of them. He considered calling her on the lie. "What do you want?" he asked instead. She smiled, a gentle curving of the corner of her mouth. "I want the treasure," she said honestly. "I've been tracking the pieces. You have two that I can confirm, and I suspect at least one more, no?" Bannok wasn't inclined to answer that; she didn't expect him to. "The Comte has two, including the piece he stole from Amelie. I know of three more." Bannok's hackles rose. She knew far too much for his liking. Was she being truthful in what she knew? And if she did know where the final three were, why hadn't she gone after them? "An impressive achievement," he said, allowing a hint of dismissal into his tone. "But counting numbers won't get you the treasure." "No," she agreed. She paused, glancing between the two of them as though weighing them up, then tilted her head forward. "I want one piece of the treasure. We work together, we take it before the Comte does, and you can have the rest." Sam snorted disbelievingly. "You'll give us all of it?" "Yeah, and what's that piece?" Sam challenged. "Does it matter?" she answered coolly. "You and your brother will have the White Horn's wealth - one piece will hardly make a difference." Sam opened his mouth with a scathing retort, but Bannok kicked him under the table. "Why should we trust you?" he asked. Sam shot him a scandalised look, but the xweetok nodded as though this was expected. "I have one piece of the map. You may have it as a sign of my good intentions." Bannok was too tired for this. It was dawn, he'd been up all night. Been chased all night by a pair of frustratingly determined guards, the guards that this exact xweetok had set on them. He didn't like her. He didn't trust her. He didn't want her on his ship. But at the same time... His instincts told him she was being honest, more or less. She wanted something from the treasure, and it was in her best interests to work with them rather than against them. Even if she was just using them as hired muscle and a free lift, they'd run out of leads - they needed the knowledge she had. His gaze fell on Amelie's painting and the parchment that had been hidden in it. His mouth tugged down into a grimace. If she was right, if it really was the Comte going after the same treasure as them... The Silver Arkmite was small fry compared to him. They'd need every advantage they could get. "Alright." He locked eyes with the xweetok, trying to get a read on her. "Alright. Give us the map piece you have and help us with the pieces we still need, and when we find the treasure you can take your one piece." He ignored Sam's strangled choking and kept his focus on her. "Deal?" For a tense moment she returned his stare with one just as intense, both of them trying to work out if they were about to be double crossed. Sam looked between the two with dawning horror. "You're not actually going to -"
The xweetok nodded. "Deal." She smiled, a much warmer one than she had before, and held out a hand. Bannok took it. Her handshake was surprisingly strong for her delicate build; it made him think he'd made the right choice. "Niettah," she supplied. "Just Niettah." "Bannok," Bannok introduced himself. The amused quirk to her eyebrow told him that she already knew, and he found himself somehow unsurprised by that. They both ignored Sam's muttered portents of doom in the corner.